If booking cancelled before 3 days before arrival, no fee will be charge. If later, 1 night of total reservation will charge. In case, no-show full amount of total reservation will be charge. Find a paradise in the heart of pulsing city. Discover Angkor Wat temples from the comfort and tranquility. 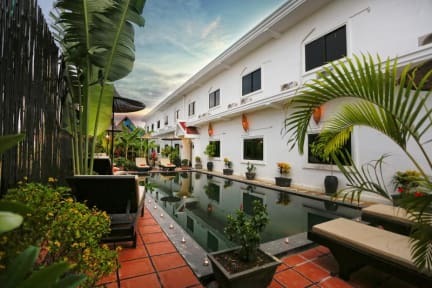 Whether you look for a starting point to explore temples of Angkor Wat, relaxation at the swimming pool or enjoying the city life, Angkor Pal Boutique Hotel is the place to stay at. Our rooms in Angkor Pal Boutique Hotel are modern furnished with a double or twin bed, desk, shelf, TV and air-conditioning or fan. All rooms have en-suite bathroom and Wi-fi is available in the whole building. All rooms have windows facing the garden. 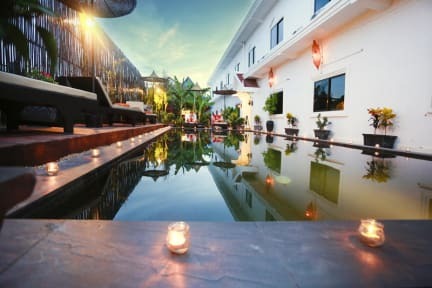 Great hostel to stay if you want to explore Siem Reap and Angkor Wat! Friendly staff, nice pool, clean rooms and good food. Not the best hostel to meet other people, because people who come there are more on their own, but that's not the hostels fault!